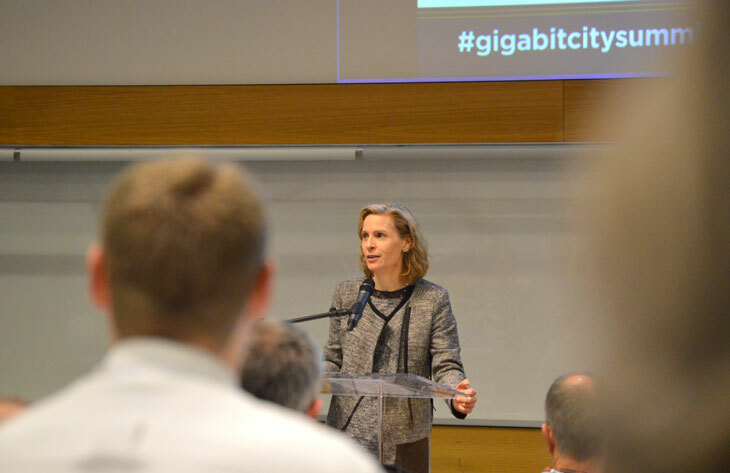 If there was a defining moment to this week’s Gigabit City Summit, it came when an unexpected speaker joined the agenda on Wednesday afternoon. 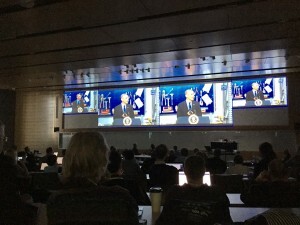 As the lights dimmed over the 200+ delegates from 49 cities filling the auditorium at Bloch Executive Hall, President Barack Obama flickered on screen and delivered a speech that will affect the future of American cities. Granted, POTUS may not have known he was joining the Gigabit City Summit’s agenda, but his remarks could not have been closer to what our broadband-centric conference was about. That is, equipping city administrators and community leaders with the tools and knowledge to build and leverage high-speed, low-cost fiber-optic broadband to drive economic development, improve education and enhance quality of life within cities large and small. 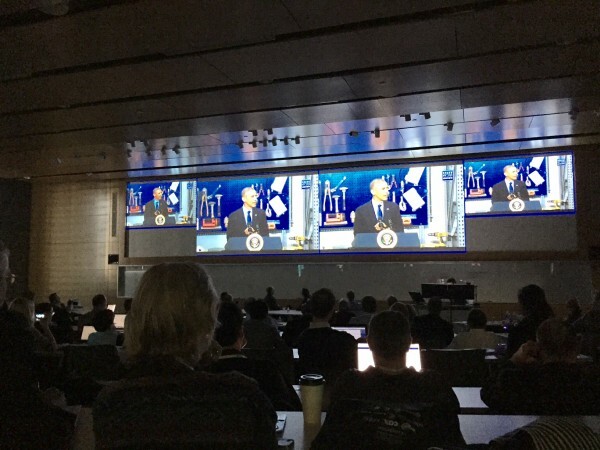 Some viewed the President’s remarks from gigabit-equipped Cedar Falls, IA, as polarizing – a cold shoulder to commercial ISPs in favor of city-owned networks. (For our part, KC Digital Drive is provider neutral.) Either way, the crowd at our inaugural national summit applauded the President’s recognizing the need for more cities to get connected. Kansas City is lucky to have multiple providers offering gigabit speeds, the most popular being Google Fiber, which sponsored the Gigabit City Summit and whose presence in the community has catalyzed many great developments, from the growth of digital inclusion initiatives (Connecting for Good, the Digital Inclusion Fund) to tech incubators and innovation hubs (Digital Sandbox, KC Startup Village). Some cities are not so lucky, and a few of these were at the Summit. Portland, Oregon, which sent 16 delegates to the Gigabit City Summit, is among 30+ cities waiting to hear if Google will lay cables in their town. Chicago, represented at the conference by the Smart Chicago Collaborative, does not have gigabit access at all. Granted, as Google Fiber spokesperson Jill Szuchmacher echoed during her Summit address, no single provider can close the connectivity gap in America. But all who were in attendance clearly recognized that in order to be competitive globally and regionally, cities (and by, extension) need to get connected. Susan Crawford speaks at the Gigabit City Summit. Those who do not understand (or believe in) the impact that high-speed connectivity can bring to a community may not see why Crawford gave such a glowing review. However, as she began to expound upon the potential of high-speed broadband to bring Internet access to neighborhoods, families and businesses within a city, a picture of a more connected America began to look life-changing indeed. Broadband, she argued, is “the most human technology we have ever seen” because it will someday allow people to truly be together across great distances. Skyping over a crappy connection will appear to future teleconferencing tech like the telegram to FaceTime. Crawford calls this ability “attentional proximity,” and it is new and old all at once. The one-two punch of Obama and his former colleague was one of many highlights from the Gigabit City Summit. We will be sharing more in the form of photos, videos and write-ups in the coming weeks. We’ll also be announcing when the next Gigabit City Summit will be held. Sign up for our conference mailing list to be the first to know when that happens. In the meantime, we thank all who traveled to KC for three excellent days of exploring the awe-inspiring potentials of broadband with us at KC Digital Drive. And if you weren’t able to make it, here is some media coverage of the event to help you get caught up. With the 2016 Gigabit City Summit coming this May, we look back on some of 2015’s finest moments. KC Digital Drive is proud to announce the 2016 Gigabit City Summit on May 16-18 in Kansas City. Find out what’s in store for next year and get your discounted registrations through January.